TOBA, Japan -- There is the soaring rhetoric. And then there's the messy reality. When President Obama and Japanese Prime Minister Shinzo Abe make an historic visit to Hiroshima on Friday -- the first time a sitting U.S. president has visited the site of the first atomic bomb attack -- their words advocating nuclear disarmament will clash with real-world security necessities. Far from backing up the vision of a world without nuclear bombs that Obama laid out in a 2009 speech that helped secure a Nobel Peace Prize, his near-finished presidency has seen a multibillion-dollar modernization of the U.S. nuclear force. Watching from the audience will be at least three Japanese survivors of the U.S. nuclear attacks, according to the Kyodo news agency. Japan's long postwar commitment to disarmament, meanwhile, is only possible because of its reliance on the so-called American "nuclear umbrella" that protects it from antagonistic North Korea and China. Tokyo, should it choose, could probably easily convert its advanced civilian nuclear program into a weapons program, and some conservatives in Abe's ruling party have argued that the country's pacifist constitution technically allows nuclear weapons. Despite his own mixed record on nukes, Obama likely sees his Hiroshima visit as a worthwhile expenditure of political capital in order to shore up a global nonproliferation effort that seems at times to be crumbling. Before the most recent of a series of nuclear security summits meant to reduce and protect nuclear material, Obama wrote in March that eliminating all nuclear weapons may not happen in his lifetime. "But we have begun. As the only nation ever to use nuclear weapons, the United States has a moral obligation to continue to lead the way in eliminating them. Still, no one nation can realize this vision alone. It must be the work of the world." Obama's vision of a world without nuclear weapons was challenged almost immediately. His April 2009 speech in Prague happened within hours of North Korea's launch of a long-range rocket that outsiders, including the United Nations, called a cover for a test of banned missile technology. Pyongyang is still barreling ahead in its push for nuclear-armed missiles that could reach the U.S. mainland. Obama secured a deal meant to limit Iran's nuclear program, if it can be implemented amid mistrust on both sides. But Pakistan and India are still locked in a nuclear standoff. The United States and Russia, which have most of the world's nuclear weapons, often see their geopolitical jockeying for position interfere with disarmament efforts. And there are growing worries about the security of nuclear fuel sites around the world. 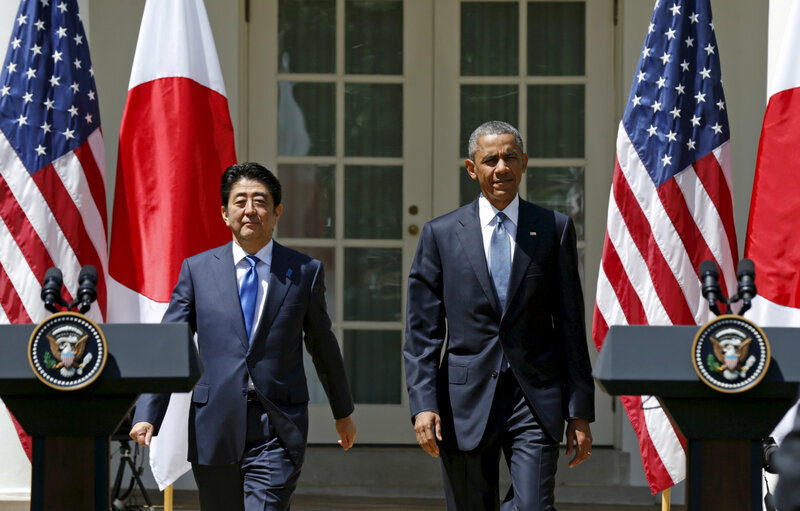 Obama's trip to Hiroshima also comes amid anxiety that North Korea's growing nuclear and missile capabilities could lead to the top U.S. allies in Asia, Japan and South Korea, starting their own nuclear weapons programs. It is highly unlikely either country will go nuclear. It could cause huge political and economic damage - crippling sanctions, global condemnation - and jeopardize their alliances with the United States. But a small group in South Korea, including some conservative members of the ruling party, and some in Japan see the North Korean danger as too grave to rely only on the protection of another country. They also question whether, despite rhetoric from U.S. officials about an "ironclad" alliance, Washington would really use nuclear weapons and risk the lives of thousands of American troops should a belligerent North Korea attack. The Chosun Ilbo, South Korea's top newspaper by circulation, said in an editorial weeks after North Korea's nuclear test in January that discussions in Seoul on acquiring nuclear weapons were inevitable. Judging by the level of American involvement in crises in Ukraine and Syria, for example, the newspaper said any U.S. help would come only after Seoul is turned into a "pile of ashes" by a North Korean nuclear attack. This fear has been highlighted by Donald Trump, the presumptive presidential nominee for the Republican party in the United States. He has questioned the amount of money the U.S. military is forced to spend to protect its allies, and has suggested that Japan and South Korea should be allowed to develop their own nuclear weapons. Japan prides itself on its pacifism and disarmament, but it is only through U.S. nuclear deterrence that the country can live alongside nuclear-armed North Korea, China and Russia, without going nuclear itself. "Some say this is hypocritical," said Ralph Cossa, president of the Pacific Forum CSIS think tank, "but I think it is just common sense and good national security policy. The Japanese would certainly be happier if no one had nuclear weapons, but as long as several of its neighbors have them, they welcome being under America's nuclear umbrella." Yukio Okamoto, a former Japanese diplomat, said Tokyo "is in the most difficult position" because it is a nuclear bomb victim, surrounded by potentially hostile nuclear-armed states and dependent for its survival on U.S. nuclear deterrence. "We have to walk through a very narrow passage of trying our sincere efforts toward total elimination in the long term, but at the same time trying to preserve the alliance with the United States and not to tarnish the security relationship, especially the nuclear deterrence," Okamoto said. Obama finds himself divided between his anti-nuclear vision and the realities of leading a global power. Worries about Japan and South Korea producing nuclear weapons mean the United States must offer them nuclear protection, thereby "going against Obama's own call for global denuclearization," Charles Armstrong, an Asia expert at Columbia University, said. "At the same time, the U.S. is modernizing its own nuclear arsenal. Thus, U.S. actions and goals are not entirely consistent." Obama's trip to Hiroshima will be filled with images of the horrors of nuclear war, and lofty statements about the need to eliminate those weapons. But some argue that for the visit to be successful, it must highlight Asia's real nuclear dangers. Michael Auslin, an analyst with the American Enterprise Institute think tank in Washington, told The Japan Times: "Asia is concerned about how Washington will deal with a more assertive China and a nuclear North Korea, not with an unrealistic aspiration to rid the world of nuclear weapons." Obama may not be able to escape criticism from all sides. Many conservatives in the United States believe a Hiroshima visit will be a failure because it will be seen as an apology. Nonproliferation activists believe he has not gone far enough in efforts to "earn" his Nobel Prize. "I did think Obama was serious about his nuclear-free world, but that was six or seven years ago. We are no closer today than we were when he took office to achieving that end," said Bruce Cumings, an Asia expert at the University of Chicago. "I'm sure he will bring up getting rid of nukes in his speech, but he's in a much weaker position today, because of the ongoing upgrading of American nuclear weapons."